In conjunction with the Gorgon Project, it reinforces our position as a leading natural gas supplier and liquefied natural gas (LNG) operator in the Asia-Pacific region. The Wheatstone Project is located at Ashburton North Strategic Industrial Area (ANSIA), 12 kilometres west of Onslow in Western Australia’s Pilbara region. The foundation project will include two LNG trains with a combined capacity of 8.9 million tonnes per annum (MTPA) and a domestic gas plant. Chevron is leading the Wheatstone Project on behalf of its joint venture participants Apache Corporation (Apache), Kuwait Foreign Petroleum Exploration Company (KUFPEC), Shell and Kyushu Electric Power Company (Kyushu). Chevron is the operator and holds a 72.14 percent interest in the Wheatstone Project facilities together with Apache (13%), KUFPEC (7%), Shell (6.4%) and Kyushu (1.46%). The project site at ANSIA, is an ideal location for an LNG hub given its proximity to the discovered gas resources in the Western Carnarvon Basin. Eighty percent of the Wheatstone Project’s foundation capacity will be fed with natural gas from the Wheatstone and Iago fields, which are operated by Chevron (90.2%) in a joint venture with Australian subsidiaries of Shell (8%) and Kyushu (1.83%). The remaining 20 percent of gas will be supplied from the Apache and KUFPEC Julimar and Brunello fields. There are precious few, suitable port sites in the region and the Wheatstone natural gas project provides a foundation for commercialising both existing and future gas resources. We are committed to providing much-needed new and cleaner burning energy to Australia and the Asia-Pacific region, and have already committed more than 80 percent of Chevron’s equity LNG from the Wheatstone Project to premier LNG buyers. LNG customers include TEPCO, Kyushu, Chubu Electric Power Company and Tohoku Electric Power Company. 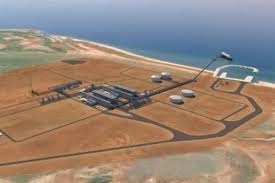 Chevron discovered Wheatstone in August 2004 and in March 2008 announced an intention to develop the gas resource as a greenfield onshore LNG and domestic gas project. Drawing on all the human energy in Chevron, including at the Global Technology Centre in Perth, the Wheatstone Project will become one of the most advanced, environmentally responsible LNG project in the world.